Attracting Hummingbirds can be hard but we have some tips to help you be successful this season. Hummingbird season has begun and usually lasts between mid-March through November. Now is the time to put out your feeders, stock up on food and let the hum of the hummingbirds begin! Hummingbirds can be tricky to attract, but follow a few simple pointers to make your yard more attractive to them and see what happens! Hummingbirds, like other birds and other animals, need food, water, and shelter, the basic necessities of life. Shelter and protection are important to attracting hummingbirds. The dense foliage of trees provides not only protection but also a source of insects and the protein they provide. Trees and large shrubs provide a resting place between meals at the feeder or flowers. 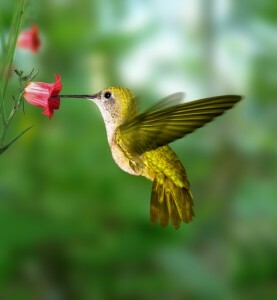 The hummingbird’s diet consists of nectar from flowers (red is the favorite color), small insects such as aphids and spiders, and sometimes even pollen and sap. Hummingbirds feed in many small meals, consuming small invertebrates and up to twelve times their own body weight in nectar each day. Many plant species rely on hummingbirds for pollination and provide nectar and tiny insects in exchange. Hummingbirds staunchly and aggressively defend a feeding area, or feeder, even when not feeding. Butterfly bushes (Buddleia davidii) usually bloom from mid-July through frost, producing long 4-5 inch flower spikes which look and smell like miniature lilacs. Buddleias produce a honey-scented fragrance that lures butterflies to its blooms, and then once there, they find the flowers super-rich in nectar. Lantanas are perennials in much of the South, and will flower in full sun or light shade, preferably in well-drained soil. As semi-desert natives, they bloom best when not overfed or over watered. Other favorites include Zinnias, Pentas, Milkweed, Salvia, Batface Cuphea, Hot Lips, Fire Bush, Nasturtiums, and Coreopsis. This entry was posted on Monday, March 13th, 2017 at 9:00 am	and is filed under News & Updates. You can follow any responses to this entry through the RSS 2.0 feed. Both comments and pings are currently closed.